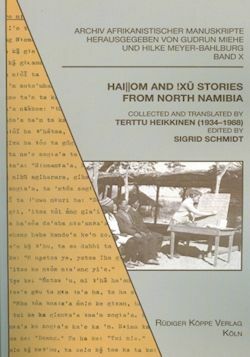 Terttu Heikkinen, missionary of the Finnish Evangelical Lutheran Mission, worked in the north of Namibia among the Hai||om and !Xû specializing on language studies. Her aim was to lay the foundation for literacy campaigns and for a translation of the Bible into the languages of these ethnic groups. In order to master their languages she recorded numerous texts on tape or had them dictated by language helpers. Among these texts were also folktales. When in 1985 the editor of the present book, Sigrid Schmidt, was working on a cata­logue of Khoisan folktales, she asked a number of fieldworkers for pub­lished and unpublished material. Terttu Heikkinen not only gave her short summaries but took the trouble of translating her tapes and notes as literally as possible. The editor recognized at once the high value of her collection not only for folktale research in African languages and ethnography but also for the study of ancient Khoisan worldview and general African prehis­tory and thus advised her to publish this collection. Unfortunately, Terttu Heikkinen died in 1988 of cancer. After her death, various attempts to publish her manuscript came to nothing until 2011 when Sigrid Schmidt finalized the present edition. Terttu Heikkinen’s stories were collected from two groups of form­er hunter-gatherers who belong to the so-called Khoisan peoples. The Khoisan peoples, the Khoekhoe (Khoi) and San (Bushmen) were the original inhabitants of the southern part of Africa and had been living there when about a thousand years ago the Bantu-speaking peoples began to penetrate from the north and to settle in the areas suitable for agriculture. Terttu Heikkinen’s collection of 45 texts, here presented in a phonetical transcription and an English translation, covers a wide range of subjects. In fact, it contains examples of the main groups of Khoisan folklore: some animal and ogre tales, several novellistic tales and legends that com­bine allegedly actual events with extraordinary elements, and even a cautionary tale to teach children. But the bulk consists of tales of the primeval time, the very own tales of the Khoisan peoples.